Printed Logo Ties or Woven Custom Logo Ties? 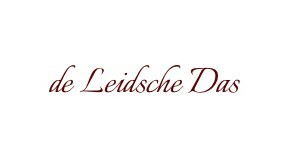 Printed logo ties or woven logo ties by the Leidsche Das. 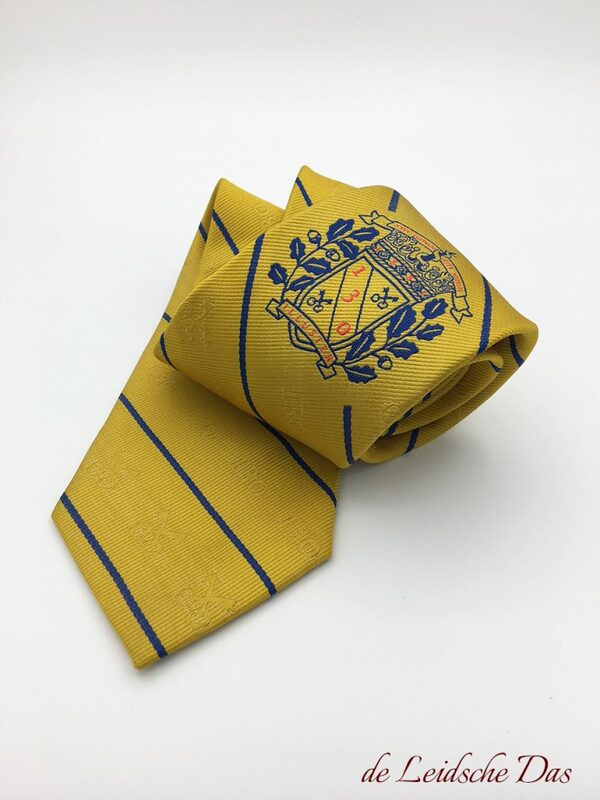 You want to have logo ties made for your company, club or organization and you are looking for a reliable tie manufacturer. 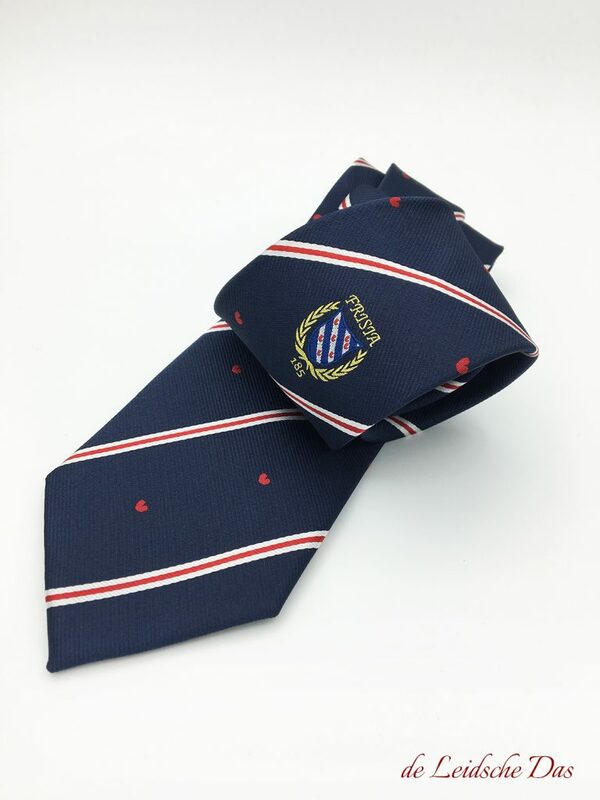 The possibilities to have logo ties made are to have them printed, embroidered or woven. If you choose for printed logo ties or embroidered ties, you choose for prefabricated ties in standard colors on which your logo will be placed! Well we do not make printed logo ties or embroidered ties and the legitimate question from you could be why not? The answer is quite simple if we would appreciate the quality and appearance of these ties we would also make them! A few examples of woven custom logo ties. Maybe you think that printed logo ties or embroidered ties with logo are more economical to purchase? Then we invite you to compare our prices and we are sure that the outcome will pleasantly surprise you. So no printed logo ties! But what do we make? Below you will find more information on our design process, prices and our production time for woven custom logo ties made in your own design. If you have your logo ties made by us, we start from scratch and that is the design process of your ties. By the way, the entire design process of your ties is completely free and you will be assisted during the process by designers with years of experience. Of course, good communication is essential between you and our designers during the design process. Although our designers are very creative, you have to indicate your wishes and ideas from which they can start designing. During the design process for your ties you can make the following choices, the length and width of your ties, the color(s) of the yarn used, your own custom designed pattern, the weaving structure of the fabric and the position(s) of your logo, image, and/or text. No printed logo ties but woven custom ties made in your own design. If you want to have logo ties designed and made please contact our design department via Contact Free necktie Design Service. Our prices for custom ties made in microfiber/polyester. Our prices for custom ties made in 100 % silk. The time we need to produce your custom made neckties in microfiber/polyester and silk after ordering. We are a Dutch company located in the historic city of Leiden in the Netherlands and we design and manufacture high quality woven custom made neckties and bow ties in silk and microfiber/polyester for companies, army, schools, colleges, universities, organizations, (sports)clubs, fraternities, societies, governments and political parties.